The city of Nijmegen lies in the eastern part of The Netherlands, near the German border in the province of Gelderland. The city has around 160,000 inhabitants. Nijmegen is considered the oldest city in The Netherlands, it had its 2000 years existance in 2005. The Romans founded a military stronghold on the grounds, and that was the first mention of Nijmegen around the year 0. After the Roman Empire crumbled down Nijmegen became part of the Frankish kingdom. In the 8th century the Emperor Charlemagne build a castle in Nijmegen. In 1230 Nijmegen was given cityrights, and became part of the Hanseatic League in 1364. 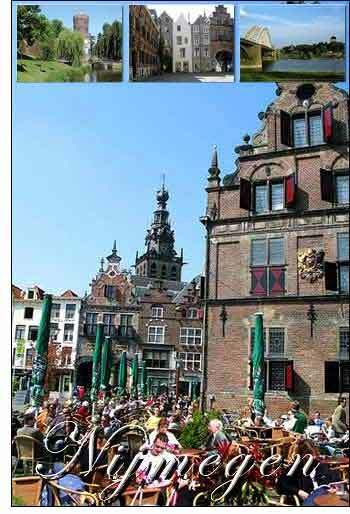 During the Hanseatic period the city florished and prospered, also because of the city lies at the Waal river. In 1585 the city became part of the Dutch Republic of United Provinces.